Important Notice 22Apr2019, 09:03. Our phones (via VirginMedia) have been out of operation since early this morning. We are patiently awaiting the restoration of their network. 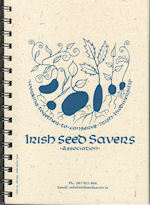 Irish Made, 100% recycled paper and board, A5 size, plain sheets, wire bound on the left, brown cover with PIG DESIGN. 60 sheets per book. 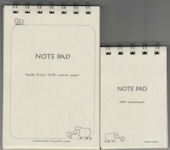 Irish Made, 100% recycled paper and board, A6 size, plain sheets, wire bound on the left, brown cover with PIG DESIGN. 50 sheets per book. Also available with plain brown cover from 10 (stamp on your logo) or with your own cover from only 60 notebooks. 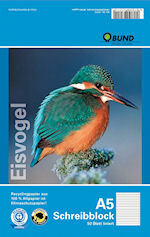 Made by Klee Paper, 280g brown cover, 80 plain pages inside: 80g memo print paper, grey backing board, all 100% recycled. Wirebound on the left. Look very nice stamped. Available from 100 with soft white or cream covers. 10 days on order. 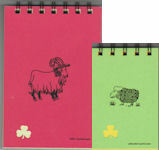 Irish Made, 60 sheets, ruled, wire bound on the left, brown cover with sheep design, 100 % recycled paper, available with your own cover from only 60 pads. 100% recycled, ruled, glued at top, 50 sheets. Flip over cover. 2-hole punched on request - please put in the comment box. 100% recycled, wire bound on left, four-hole punched and micro perforated, 80 sheets. 100% recycled, squares, glued at the top with flip over cover, 50 sheets. 100% recycled, squared paper, 80 sheets, wire bound on left, four-hole punched & perforated. 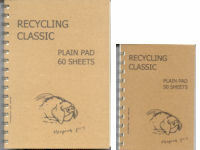 100% recycled, available in A4 and A5 with 50 sheets, both pads are glued at the top. 100% recycled notepad, glued at top with 50 sheets. 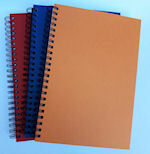 100% recycled steno notepad, wire bound with 80 sheets. 8x5". 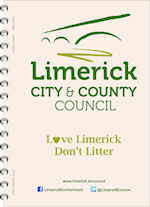 100% recycled, ruled, 40 sheets, wire bound on the top, A6 size. 100% recycled paper & card, A6 size, 50 plain sheets, 80g, wire bound on the side, personalised cover using beautiful Cairn Card in cinnamon, olive, raspberry, blueberry, plum. Covers are screen printed in 1 colour. Delivery time: 3 weeks. 100% recycled paper & card, A5 size, 50 plain sheets, 80g, wire bound on the side, personalised cover using beautiful Cairn Card in cinnamon, olive, raspberry, blueberry, plum. 100% recycled paper & card, A5 size, 50 plain sheets, 80g, wire bound on the side, personalised cover using brown, speckled ivory or white recycled card. 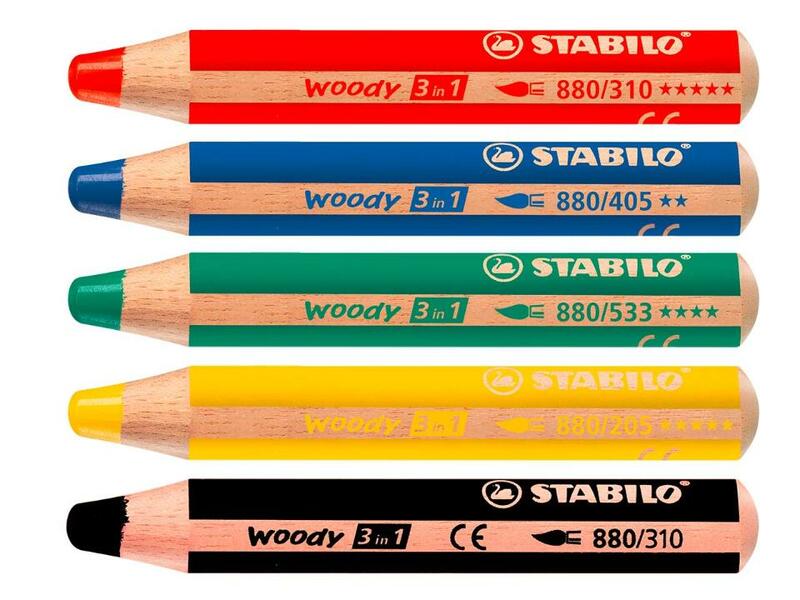 For smaller quantities under 200 books, add €25 set up fee, no charge for repeats of the same design. Made by Klee Paper, delivery time 2-3 weeks. 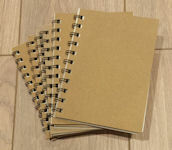 100% recycled paper & card, A5 size, 50 ruled sheets, 80g, wire bound on the side, personalised cover using brown, speckled ivory or white recycled card. 100% recycled paper & card, A6 size, 50 plain sheets, 80g, wire bound on the side, personalised cover using brown, speckled ivory or white recycled card.